As part of my internship I am able to visit two museums or research centers, to further my research, to see their museum collections, and to visit with the curator. One of the sites that I have selected is the Center of Southwest Studies at Fort Lewis College in Durango. My request for a visit was received enthusiastically by the curator when I told her about my internship. She recommended that I visit the Southern Ute Museum in Ignacio. I have made contact with the museum to see if I can set up a private tour and a meeting with the curator. I am hoping to visit them during my fall break. I look forward to sharing with you about my visits and posting some photographers from my trip. 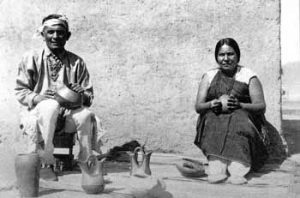 Eastern Keres or Keresan: Cochiti, Santo Domingo, San Felipe, Santa Ana, and Zia. Zuni: Spoken at the single village of Zuni. Hopi: Is a confederation of a number of villages spread across three mesas. 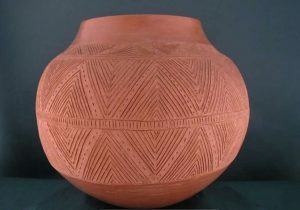 Northern Tiwa: Taos and Picuris and Southern Tiwa: Isleta and Sandia (by Albuquerque). They can also be grouped under the generic name Tiwa. 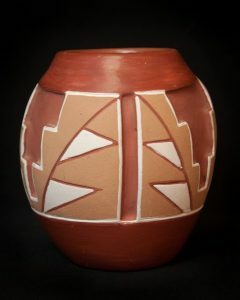 Towa: Is spoken only at the Jemez Pueblo. As I do my research I feel like I am working on a puzzle that in the end will not just be about the artifacts, but about languages, artists, history, and life of some beautiful people. I had the privilege this week of assisting with unpacking and displaying some Apache artifacts. The Apache collections consists of headdresses and woven baskets. I would like to share some of my research findings about the Apache headdress known as, “Gaan Apache Headdress”. The Gaan is a mountain spirit / supernatural being who have lived in mountain caves since the world was created by Yusn. They are the Apache’s protectors and teachers; appearing at dances during ceremonies. They come in groups of five, four symbolizing the four quarter of the earth, and the fifth to lead the dance and mediate between the dancers and the humans. The correct name for the headdress is “Apache Crown Dancer”. Crown dancing is a very old and sacred dance tradition. 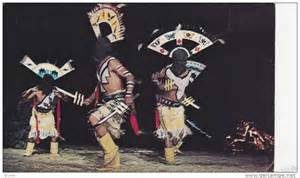 According to Apache belief, the dance was taught to the Apaches by the mountain spirits as a means of healing. Apache believe that the creator sent the Gaan to the Apache to teach them to live in harmony. May your journey in life be filled with harmony. Feest, Christian F. The Cultures of Native North Americans. Konemann Verlagsgesellschaft mbH. 2000.